Driving the “High Road” from Santa Fe to Taos is a required pilgrimage for lovers of New Mexico art and history. Winding through magnificent mountains and ancient villages, the High Road is a scenic and historical wonder that will take you back to Spanish colonial times in New Mexico. If you are planning the High Road as a day trip, get an early start: it will require more than four hours of driving time, not including all the stops you’ll want to make. If you’ve set aside two or more days, plan to stay overnight in Taos and spend the entire first day exploring the many sights along the way. Start your drive by heading north out of Santa Fe on US 84/285 (St. Francis Drive.) Just past the Buffalo Thunder Casino and Resort at Pojoaque Pueblo, turn east on NM 503. This is where the old-time feel of El Norte (the North Country) begins with a tree-shaded drive along Pojoaque Creek. On both sides of the road you can spot old adobe farmhouses with pitched metal roofs in the characteristic style of 19th century New Mexico. Just past the turnoff to Nambe Pueblo, the road climbs out of the valley and into the badlands, a barren but colorful landscape of eroded cliffs and mesas. Look to your right (east) for beautiful views of the Sangre de Cristo mountains. Turn left on NM 520 and descend out of the badlands into the village of Chimayó. A stop at the adobe chapel, Santuario de Chimayo, is mandatory. El Santuario (the Shrine) was built 1814 to 1816 on the site where, according to local history, a miracle had occurred a few years earlier. During Good Friday observances around the year 1810, a worshipper saw a bright light springing from a hillside near Chimayo. Arriving at the spot, he began to dig at the light and soon uncovered a crucifix. Joyous at the discovery, the townspeople and priest carried the crucifix in a grand procession to the church at the nearby village of Santa Cruz. The next morning, however, the crucifix was gone, only to be found back in its hole in Chimayo. After this miracle occurred three times, the people and their priest finally understood that the crucifix wanted to remain in place, so a local family built a shrine for it on the site. Other mysteries quickly followed as the crucifix was found to have healing powers. By 1814, construction of a larger shrine, the existing chapel, was begun to accommodate the hundreds of pilgrims who came seeking their own miracle. The crucifix is still in place in the altar of El Santuario, but over the years it has been overshadowed by the healing powers of the dirt from the hole in which it was found. The prayer room, next to the sacristy which contains the hole, is filled with discarded medical devices and other offerings left by the faithful who have been healed. Among connoisseurs of Spanish Colonial art, El Santuario is known for its spectacular painted altar screen which recently was restored to its original, colorful glory. The chapel itself is considered to be one of the finest examples of Spanish Colonial architecture in New Mexico. Chimayo also is famous for beautiful hand-woven blankets. They have been a staple product of the community for hundreds of years, and you can see Chimayo blankets being woven on traditional hand looms at three different shops convenient to your route. Proceed north on NM 520 to the intersection with NM 76. On your left is Ortega’s Weaving Shop. If you turn left (west) onto NM 76, you’ll see the Trujillo family’s shop on your right. Or, turn right (east) onto NM 76 and look for Centinela Traditional Arts on your left. To resume your drive, head east on NM 76. After about 7 miles, you will see the village of Cordova in the valley far below to your right. Follow the signs into town. Cordova is famous for distinctive folk carvings in unfinished aspen and juniper wood. Stops at the home-shops of well-known carvers Sabinita Lopez Ortiz, Gloria Lopez Cordova, and Eurgencio Lopez are more than worth the detour. Also check out the Castillo Gallery at the east end of town for traditional carvings and contemporary sculpture. Continuing east on NM 76 you will climb into the town of Truchas, clinging to the side of the canyon. After stopping to absorb magnificent views of the 13,000 foot Truchas Peaks, explore the growing number of fine art galleries dotting the quiet adobe village. A few more miles up NM 76 will bring you to the Mission Church of San Jose de Gracia at Las Trampas. Built about 1760, it has been called the best preserved and most beautiful Spanish Colonial church in the United States. The Church of San Jose is open Fridays and Saturdays plus Sunday mass, but it is well worth a stop and a photograph any day of the week. Continue on NM 76 to NM 75 and detour west to Picuris Pueblo. This village of Tiwa-speaking Pueblo Indians was settled about 750 years ago by descendents of the Anasazi. Learn about Picuris history and arts at the Tribal Museum and through a self-guided tour of nearby ruins. Returning to NM 75, follow it east (north) to NM 518, and begin your climb over the Sangre de Cristo Mountains. Look for the scenic vista turnouts at mileposts 51.5 and 61.2. Stop for a few minutes to take in the pure air as well as the unmatched views of the mountains and valleys of Kit Carson National Forest. Nearby Wheeler Peak is New Mexico’s tallest mountain at 13,161 feet. After descending out of the mountains and into the Taos Valley, NM 518 will end at the village of Ranchos de Taos. Turn left onto NM 68 and drive two long blocks. On your left is a sight you are likely to recognize even if you’ve never been there before. It is the 1815 Church of St. Francis of Assisi, with its famous back facing the highway. The austere beauty of its massive adobe walls have lured hundreds of painters and photographers such as Georgia O’Keeffe and Ansel Adams. It surely is the most frequently depicted church in all of American art. After exploring St. Francis church and the Ranchos de Taos plaza, head north on NM 68 into Taos. Now a town of about 5000 people, Taos was settled by a handful of Spanish farm families in 1615, just five years after the founding of Santa Fe. It remained a quiet farming village well into the 20th century when its relative isolation was broken by the advent of paved highways and the town’s fame as the home of the southwest’s first professional art colony, The Taos Society of Artists. Though a few farms remain, Taos now thrives by accommodating visitors seeking fine art in its many galleries and native history at the centuries old Taos Pueblo. Any visit to Taos should start at the pueblo, just north of town off of Paseo del Pueblo Norte. The pueblo has been home to the Tiwa-speaking Taos Indians since about 1100 BCE and is one of the oldest continuously inhabited communities in America. The existing buildings were mostly constructed before the year 1400 and, with the exception of added doors and windows, look much as they did when members of Coronado’s expedition visited the Pueblo in 1540. Taos Pueblo is a UNESCO World Heritage Site and one of the most awe-inspiring experiences of native history and life available to visitors in the U. S.
The village of Taos has several fine, small museums highlighting the region’s art and culture. 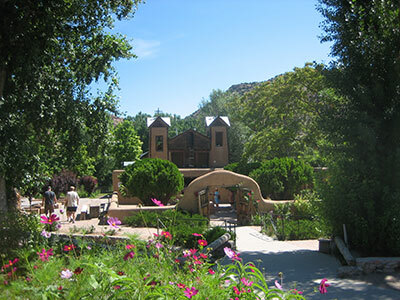 The Taos Art Museum is located just a few blocks north of the plaza in the former home of artist Nicolai Fechin. The museum owns an excellent collection of paintings by members of the Taos Society of Artists and other painters of the southwest. The house itself also is an extraordinary work of art and architecture. The artist built the home himself in the 1920s, filling it with hand-carved woodwork and furniture which combines elements of the southwest with folk motifs from his native Russia. Continue on US 64 four miles north of the plaza to the Millicent Rogers Museum. A Standard Oil heiress who was deeply committed to preserving arts of the southwest, Millicent Rogers amassed an extraordinary collection of Native American and Hispanic objects, with a particular emphasis on Indian jewelry and Navajo and Hispanic textiles. The museum also houses an remarkable collection of pottery from the renowned pueblo potter, Maria Martinez. For a glimpse of what Taos was like in the 19th century, take Millicent Rogers Lane south from the museum, turn right on Upper Ranchitos Road, and then right again on Lower Ranchitos Road. This beautiful, tree-lined drive takes you through old farming neighborhoods with their acequias (irrigation ditches) and adobe family compounds. To immerse yourself in early Taos history, visit La Hacienda de los Martinez (Martinez Family Ranch) on Lower Ranchitos Road. Built in 1804, this beautifully preserved 21-room house was the center of a large farm and ranch operation, as well as the headquarters of an extensive trading business that brought goods over the Camino Real and Santa Fe Trail. Because raids by the Navajo, Comanche and Apache were still an occasional occurrence in the early 1800s, the house is fortified with smooth adobe walls on the exterior and two enclosed courtyards on the interior into which the home’s window and doors open. The sparsely furnished rooms and rugged workspaces create an indelible picture of life on the southwestern frontier. From La Hacienda, take Lower Ranchitos (NM 240) east toward town and turn right on Ledoux Street to visit the Harwood Museum and the E. L. Blumenschein Home. Co-founded by two members of the Taos Society of Artists, the Harwood contains an excellent collection of fine art and craft from the Taos area that spans the 19th and 20th centuries. The museum also organizes a variety of special exhibitions. Just north of the Harwood Museum is the home and studio of one of the founders of the Taos Society of Artists, Ernest Leonard Blumenschein. The home is maintained much as it was when Blumenschein, his wife and daughter (also artists) lived there in the 1920s and 1930s. It contains a fine collection of the family’s art, surrounded by their collection of Spanish Colonial and European antiques. To see how another great artist lived and worked, head to the E.I. Couse Home and Studio on Kit Carson Road one block east of the plaza. During the early 20th century, Couse was one of the most famous painters of Native American subjects in the country. Parts of the house date to 1839 and the interior retains the furnishings and collections owned by the Couse family. The property also includes two studios used by his fellow member of the Taos Society of Artists, Joseph Henry Sharp. For your final museum stop, cross the street and head back toward the plaza to the Kit Carson House. The legendary trapper, scout, military man, and author moved to Taos from his native Kentucky in 1828. In 1843 Carson married his third wife, the fourteen year old Josefa Jaramillo and they moved into the spacious adobe home, built about 1825. The house is recently restored with new exhibits. There, at the corner of Kit Carson Road and Paseo del Pueblo Norte you are just steps from dozens of fine art galleries. The largest clusters of galleries spread out from the plaza on Kit Carson Road, Paseo del Pueblo Norte, and Bent Street, all within a four block radius. Leave your car for the day because galleries, shops, restaurants and lodging are all within easy walking distance. When you are ready to head back to Santa Fe, take NM 68 for your last spectacular views of El Norte. About six miles south of Ranchos de Taos, the road will climb onto the side of a hill from which you can view the great sweep of sagebrush flats backed by Taos Mountain and the village at its base. Just after milepost 34, pull off the road at the picnic shelters and look to the north. Down through the grey-green mesa cuts the Rio Grande Gorge, a sheer-walled canyon that drops 800 feet to the Rio Grande. A few miles farther south, you’ll gain a different perspective on this magnificent landscape as the road descends into the canyon and hugs the river. Sunlight filters through cottonwood trees and splashes on the water. The walls of pink and salmon colored rock make a constantly changing frame for the view. If you want to relax while enjoying a view of the canyon, plan to stop for lunch or dinner at Embudo Station, (open April through October) an old station stop on the narrow gauge railroad that was built through the canyon in the 1880s. The tree-shaded dining patio is at water’s edge, so kick back and watch the river roll by. Unfortunately, good things can’t last forever. As you continue on your way, you’ll notice the canyon becoming shallower and wider until it finally eases its grip, releasing you once again onto the open desert. You are now just 50 minutes from Santa Fe, a gourmet dinner, and a good night’s sleep.